Why does the Baumgarten accident once again evidently prove that the Third energy package is not a universal means of ensuring the security of gas supplies? All the world-leading sources of energy information immediately reported on an explosion in the Baumgarten gas hub in Austria on December 12, which resulted in a disruption in gas transmission affecting a large part of Europe. The accident caused disrupted supply to Italy, Slovenia, Croatia, Slovakia, Hungary and even the UK receiving gas from Belgium and the Netherlands. Gas Connect Austria, the operator of Austria's gas grid said late December 13: "The initial suspicions that the accident may have originated with a newly installed filter separator have been increasingly confirmed by the evidence in the course of the day." Moreover, like if accompanied by bad luck, the disaster occurred at the worst possible time. Concurrently, compounding supply problems, Europeans, especially in the UK, heard some disturbing news from the Norwegian network manager who said that gas flows would be trimmed from Troll, Europe’s largest offshore gas field. It takes about two weeks to bring LNG from Qatar, the U.K.’s biggest supplier of the super-chilled fuel. Last but certainly not least, in Italy, where rain, snow and extreme cold weather have disrupted traffic in the north-east over several days, the country’s industry minister declared a state of emergency due to a lack of gas supplies. As a common result, it pushed up the price of natural gas in many EU countries. In effect, the gas supply crisis sparked much debate on the role of LNG trade development and the importance of further gas imports routes diversification. For example, only one tanker, the Bu Samra, was confirmed as arriving in the U.K. in December. In addition, this shortage in supply coincided with the first tanker Chris. de Margerie from Russia’s Arctic plant Yamal LNG that also has headed to Britain and would arrive in Grain LNG Terminal on the Isle of Grain, 60 kilometers east of London in a few days. 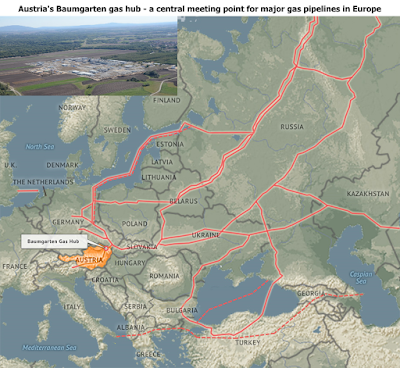 Apparently, at this time many in Europe felt a prevailing sense that there was something wrong with Europe energy heart because Baumgarten gas hub is really a key distribution knot for the European gas market - this facility 50 kilometers northeast of Vienna transports the equivalent of about a 10th of European gas demand. It handles some 40 bcm of natural gas mainly from Russia and Norway per year, Deutsche Welle reported. According to a fact sheet of Gas Connect Austria GmbH, the gas reception and distribution point at Baumgarten an der March was commissioned in 1959 and took its first gas shipment from Russia nearly half a century ago in 1968. Natural gas from Siberia has to travel about six days to make the 4.000 kilometers trip to Baumgarten where the incoming gas is measured, cleaned, dried and finally compressed for dispatching further from Baumgarten within Austria, as well as to Germany, France, Hungary, Italy, Slovenia and Croatia. OMV was the first company in Western Europe to conclude in 1968 a long-term contract for gas suppliers from the Soviet state. OMV holds an interest of 51% in Gas Connect Austria, 49% are held by AS Gasinfrastruktur GmbH. Allianz Group and Snam S.p.A., 60% and 40% respectively, own the latter. Now Gas Hub Baumgarten is known not only as a key distribution knot. With the establishment of Central European Gas Hub AG (CEGH), it became the main platform for modern gas trading in Central Europe. CEGH was founded in 2005 as a subsidiary of OMV Gas & Power GmbH. In December 2009, CEGH together with Wiener Börse AG opened the CEGH Gas Exchange Spot Market. The Futures market followed in December 2010. CEGH is owned by OMV Gas & Power GmbH (65%), Wiener Börse AG (Vienna Stock Exchange) 20% and the Slovak gas transmission system operator Eustream a.s. (15%). This brief overview of the Baumgarten facility history and current status helps us recognize that the events associated with it can be actually regarded as an important indicator or pointer to those features of the extraordinary situation that need to be taken into account to indeed facilitate European gas market development in favour of gas consumers in EU member states. The Baumgarten accident reminds us of the consequences of disruptions in the operation of gas infrastructure. Following the European Commission’s lead, EU member states have recently put into place a framework to decrease the impact of supply disruption, by means of an update of the so-called Security of Gas Supply Regulation. However, in the current political debate on EU energy security, the risks associated with infrastructure had been diverted by concerns over EU dependence on Russian gas imports. On September 13, President Juncker announced in the context of his State of the European Union Speech, that the Commission is going to expand the application of the Third Energy package rules for gas pipelines entering the European internal gas market. In addition to the EU itself, this will have much influence on energy connectivity with at least six countries more or less involved in gas deliveries to the EU by pipelines including Algeria, Libya, Morocco, Norway, Tunisia and Russia. There are four pipelines in the Mediterranean Sea that transport gas to the external borders of the European internal market: Transmed, Greenstream, Maghreb-Pipeline and Medgaz. They bring gas from North African countries to delivery points on the Mediterranean coast of Italy and Spain. Moreover, a new Mediterranean pipeline, the Galsi project from Algeria to Italy, has been planned to become operational only in 2018. As to Russia, in the Baltic Sea, the first Nord Stream pipeline has been operating already for several years. In the future, after the expected Brexit, the UK may be also in the list of countries that should become subject to the Third Energy package. It can happen especially because flows of gas between the UK and the Netherlands through the 235 kilometers BBL pipeline beneath the North Sea should go bi-directional from autumn 2019. After the new initiative of the European Commission, even more questions appeared if to take into consideration how previous attempts to make incoming gas pipelines, in particular Russia’s Nord Stream 2, subject to the security of gas supply regulation had been already treated controversial. For example, in early this year Jonathan Stern, the founder of the OIES warned that any restriction of Russian gas supplies – which have the lowest cost of delivery for substantial volumes of pipeline gas into Europe - would inevitably increase the price of the commodity in Europe. Nevertheless, public and business opinions that dependence on Russia has been politically used unreasonably extensive have long been ignored. The Baumgarten incident puts forward a strikingly different from the old ones, yet quite powerful argument in that connection. "If the Baumgarten incident shows anything", the article by the Centre for European Policy Studies in Brussels (CEPS) states, "It is that energy security is not only synonymous with diversification of import sources. Resilience against disruptions like the one that occurred in Baumgarten requires a degree of redundant infrastructure, including storage, domestic transport and import systems." While confirming such a logical assumption, Italian industry minister Carlo Calenda told reporters, as quoted by Reuters, "If we had had the TAP, we would not have to declare a state of emergency." The same is true for new offshore gas pipelines Nord Stream 2 and Turkish Stream that Russia is developing now to enlarge reliability of gas supplies to Europe. Very recently, while summarizing conclusions about the future of European gas, Jonathan Stern has continued again that the political and media perception is that the principal threat to European gas security comes from Russia… By contrast, analysis based on future gas supply and demand sees Russia as the only possible source of additional large-scale gas supplies for Europe, after the current wave of surplus LNG supplies is exhausted (probably around the mid-2020s). Although there is most probably no need to wait so long given that at the moment anyone following current developments in European gas market can already witness an unprecedented increase in gas imports from Russia this year. As has been reported in New Europe, the EU affairs newspaper, on December 27, in early November Austria had beaten its record for Russian gas imports set in 2005 at 6.8 bcm. According to estimates, from January 1 through December 21, 2017, Gazprom delivered to Austria 8.25 bcm of gas, a rise of 2.4 bcm - 40.7% more than for the same period of last year. Baumgarten has directly involved in achieving this high results. However, the mood from high results and ongoing festive season was overshadowed by the accident at Baumgarten, which became another proof of that there is an undoubted priority of reliable and diversified gas transportation infrastructure over Brussels political ambitions. Most regrettably, this has been achieved through human losses and health of people - one person died in the blast while a further 21 were injured, one seriously, according to officials. If it is hard to recall at once, Ernest Hemingway, an American who lived in Europe, evoked John Donne, who wrote, "never send to know for whom the bell tolls…"
Why shouldn't we say that the Baumgarten "bell" tolled for a short-sighted political approach being imposed by Brussels on the EU security of gas supplies?